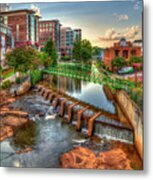 Just Before Sunset Reedy River Falls Park Greenville South Carolina Art by Reid Callaway - 6.625" x 10.000"
Just Before Sunset Reedy River Falls Park Greenville South Carolina Art framed print by Reid Callaway. Bring your print to life with hundreds of different frame and mat combinations. Our framed prints are assembled, packaged, and shipped by our expert framing staff and delivered "ready to hang" with pre-attached hanging wire, mounting hooks, and nails. 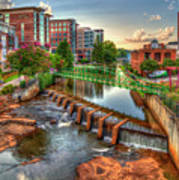 Thank you Mary Ann Weber for making this image one of your personal Favorites! Thank you Lynn for admiring my artwork! Thank you Ricardos Creations for your kind words and for making this image one of your personal Favorites! Thank you Judy Vincent for enjoying my artwork and for making this image one of your personal Favorites! WOW - fantastic capture, and post processing! Masterfully presented as always - well done, Reid.